Quench your pets’ thirst for clean water with a drinking fountain designed for small dogs and cats. The natureSPA from AVPpet circulates a continuous flow of water that passes through a charcoal filter to absorb odors and impurities. The filtered water is aerated, so it’s full of beneficial oxygen. Plus, the moving water keeps dust from settling on the surface. 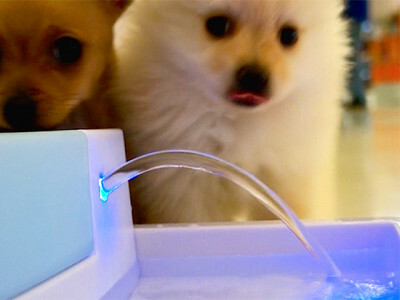 The blue LED nightlight makes it easy for pets to use the fountain at night (and keeps pet owners from tripping over it in the dark). 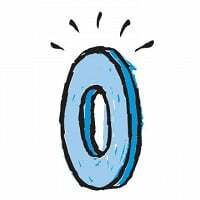 An optional UV sterilization feature reduces the presence of microorganisms and bacteria. The creators of natureSPA, Bophet Inthivong and Lane Labbe, are longtime animal lovers. Bophet hung around elephants and had a pet buffalo when he lived in Laos, and Lane has a menagerie of animals -- including horses, cows, dogs and cats -- at his home. They know our pets don’t want to drink dirty water any more than we do… and let’s face it, water bowls can get a little slimy when we’re busy. Pets will drink more of their water if it’s appealing, and drinking more water can help reduce the risk of dehydration and urinary tract infections. With a natureSPA fountain, our four-legged friends have easy access to fresh, bubbly water. Are there any pet lovers out there? Great!, and boy have you come to the right place. After a few years in this business we have come up with the best little pet watering station ever made. The Nature Spa has it all. UV filtration, low water shut-off, and a cool little square design that doesn't take up the whole kitchen floor. We have found that pets drink more water when it's flowing and that's what our fountain is all about. Hi, I really like the idea of this product, particularly the UV sterilization. It appears it is made from some sort of plastic. Is that correct and if so, is it BPA free? Thanks! ABS (Acrylonitrile butadiene styrene) is a very strong and rigid plastic. It is popular for its toughness and resistance to impact. Although considerably more expensive than polystyrene, ABS has superior hardness, toughness and gloss. It is dishwasher safe. BPA free. Hi there. I love the look of your fountains! I currently have a more mainstream electric water fountain that gets pretty dirty and needs to be cleaned weekly. How often does your higher end model need to be cleaned? Thanks! Why doesn't anyone market a bowl-shaped pet fountain, rather than ones with corners? I have had a couple of different kinds of these fountains, and they all get slimy in the corners where it's really difficult to clean. Inside, too. So far... more trouble than they're worth! Is yours any different? Have a bowl shaped fountain. Hesitate to say brand. It works okay, but personally would rather have uv sterilization. Nice touch. This is an important point. The bowl is more of a "rounded square" shape. Not exactly a true square and the rounded corners help with the ease of cleaning. Bophet will chime in shortly with more insight into this area. Our pet water fountain is rounded square corner, easy to clean & dishwasher safe! reason for square design is, it fit perfectly in any corner. Any chance we could get the dimensions on this product? I agree that it should be ceramic but hopefully it is high quality plastic that repels bacteria, etc. Our pet water fountain is made out of ABS type high quality plastic! @ Diane ... neither will I !!! Even if I felt assured it was 'safe', I wouldn't support anything that I know comes from China. Is the plastic BPA free? Please answer yes or no for clarity. Thanks. Good question. So we can give you an definitive answer, we are currently verifying with the company's manufacturer. We will get back to you on this as soon as possible. Don't mean to rain on anybody's parade, but my dog's vet cautioned me about using plastic water bowls which he said caused my dog to get a case of "juvenile acne" on her muzzle. We use stainless steel bowls for food and water; we clean them whenever we fill them. Also, I agree about water bowls not having corners...a square bowl is not a good idea. @Arlene Thanks Arlene and all . I read your comments and decided not to get because of the concerns about the plastic, China etc... I will get a stainless one from Amazon. If your dog has any sensitivity to plastic, then we would not recommend this product for you. In regards to the bowl being square, the corners are rounded and people with limited space like how well it tucks into a corner. bowls for water and food. I wash/sterilize the bowls after each feeding, morning & evening, and replace fresh drinking water. One of my dogs is 15 and has never had a health problem. I do not recommend ANY plastic products for food or drinks, let alone anything made in China/Taiwan/Hong Kong regardless, of their assurances. This looks like a great fountain! I really like the UV feature, as well as the night light. I have multiple pets, and have tried many different fountains over the years. I have never seen one with a UV option. While I do agree that, generally, the round fountains are easier to clean, it really depends on what the interior of the fountain looks like. Is there a photo available of the interior of the fountain? As to the canine/feline acne question, it is possible that some pets will develop acne on their chins from using plastic bowls for food and water, but I have not found it to be all that common. At this point, do you have any plans to produce a ceramic fountain? Hi, I have this fountain (uv light) and I find that if i don't take the entire thing apart including the moter, that moss starts to grow on it in about a week. Is their something that I can do to prevent this? I love the fountain other wise, it's quite, not too big and just enought water for my mid sized dog. Bophet had to step away for a moment but he's planning on answering this question. Do you give the bowl a rinse every night? Perhaps that would help if you aren't already doing so. @Amy Bernstein - Looks like he couldn't come back. I hope he's okay. I agree with Arlene, plastic dishes have been associated with cat acne for two decades (at least). Is there something new with that info that I haven't heard? I invested in a nice round ceramic fountain/waterfall dish, but it took so much more time to clean than just putting down a clean dish of water, my cats are back to plain ceramic bowls. I do like the UV feature, surprised it is not that much more. Perhaps if you do ceramic I might consider it for the UV light. I too would be hesitant to use a plastic water bowel. I have a ceramic bowl with a bubbler and a charcoal filter and I think it is safer. However, there is no night light. We understand yours and others concerns about the plastic. There are many reasons that go into choosing a material. The durability of plastic and inability to break is one of the reasons that plastic was chosen. While pet acne does occur with some animals, we have found it isn't extremely common. These kinds of waterers are a great idea, but one of my cats cannot eat or drink from anything that has any plastic parts. He throws up constantly if he does. Having just a ceramic bowl doesn't work either; the pump is plastic, causing the problem too. I'd bought several different kinds before I learned about the plastic sensitivity problem. Looks like a good product idea. However, I don't buy "plastic" bowls for my pets. Secondly, more importantly, I don't buy anything from China centered around food (food, containers, utensils, etc.) for people or animals. sorry. Quench your pets’ thirst for clean water with a drinking fountain designed for small dogs and cats. The natureSPA from AVPpet circulates a continuous flow of water that passes through a charcoal filter to absorb odors and impurities. The filtered water is aerated, so it’s full of beneficial oxygen. Plus, the moving water keeps dust from settling on the surface. The blue LED nightlight makes it easy for pets to use the fountain at night (and keeps pet owners from tripping over it in the dark). An optional UV sterilization feature reduces the presence of microorganisms and bacteria. The creators of natureSPA, Bophet Inthivong and Lane Labbe, are longtime animal lovers. Bophet hung around elephants and had a pet buffalo when he lived in Laos, and Lane has a menagerie of animals -- including horses, cows, dogs and cats -- at his home. They know our pets don’t want to drink dirty water any more than we do… and let’s face it, water bowls can get a little slimy when we’re busy.